As your business continues to attract more qualified leads, you will likely turn to PPC marketing to help you achieve your sales goals. Not only is PPC a proven way to engage your ideal customers, but it is also the perfect way to drive clients who are ready to buy from you instantly and without the ramp up period associated with organic SEO. In a constantly changing business landscape, you need to measure digital marketing success of your PPC campaigns if you want to ensure that your online marketing tactics are working. If your company is spending any money on PPC, then you need to be measuring specific metrics to help increase conversions and improve ROI. The great thing about PPC marketing is that there are so many metrics that your business can use. However, the amount of data available can quickly overwhelm PPC managers so you should have a firm understanding of what different parameters mean if they are important, and how to apply accurate information to your overall PPC strategy. 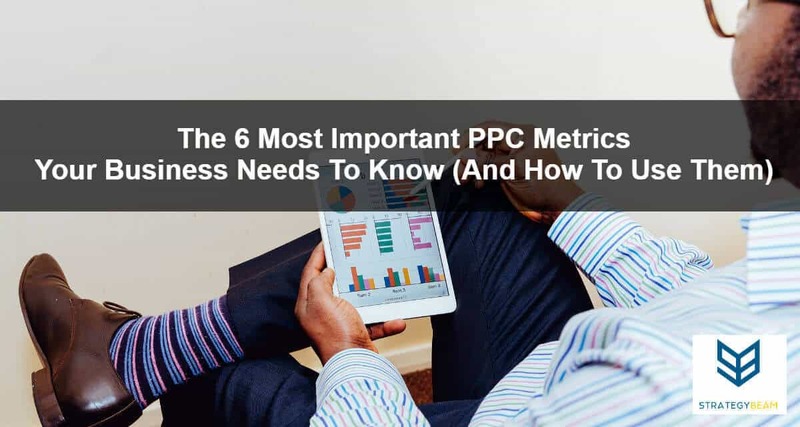 As mentioned above, there is an extensive list of metrics that your business can use to analyze your PPC performance and right future strategy decisions. Since there are so many metrics at your disposal, you will need to choose the most important parameters based on your needs and plan. Here is a quick list of the most important PPC metrics that I reference when am reviewing the performance of a business PPC account. You can use this list to quickly identify which metric you need to use when evaluating your own Adwords account so you can build a comprehensive narrative about your online marketing strategy. Among the most technical metrics that your business needs to look at is some clicks each campaign, ad group, and individual ads receive. If somebody clicks your ad, like on the headline of a text ad, Google AdWords counts that as a click. Typically the more ad clicks that, the better as this means more people are coming to your site from your PPC ads. Clicks can help you recognize how well your ad is attractive to individuals who view it. Relevant, highly-targeted ads are more likely to get clicks. This means that you can look at a number of clicks of an ad when evaluating the quality and relevancy of your ads. CPC is an important metric that you can use when evaluating how efficient your PPC budget is spending on your campaigns. Typically, a low CPC means that your ads are engaging and you have a good Quality Score for ads across your campaign. This metric helps you identify ads that should be broken out or optimized because ads with high CPC tent to be less relevant and should be made into their ad groups. If your CPC is low, it also means that your ads took fewer impressions to acquire the same amount of clicks on an advertisement. But depending on how much you are bidding this can vary throughout campaigns. CPC is a robust metric because it combines the relevancy of your ads with actual dollars spent. However, you need to refer to other parameters as you consider CPC in your overall PPC marketing strategy to ensure you give proper context to your ads and your PPC efforts. Click-through rate (CTR) is one of the purest Adwords metrics and will be the lifeblood of any real Google AdWords account. This metric is an equation that you can find from dividing clicks by the Impressions your ads obtained. CTR may be used to help you determine the effectiveness of your ad messaging, positioning, and the keywords that you are focusing on. CTR helps evaluate how well you are communicating with your audience. A high CTR indicates that you’re targeting the right audience with proper keywords and ad text, and those searchers are responding by clicking through to a website. On the other hand, a low CTR could mean that there is some disconnect between you and your viewers. If you want to maximize your PPC marketing budget and maximize opportunities to reach your target audience, then you need to focus on improving your Quality Score. Google AdWords uses a sophisticated bidding system that includes your keywords, ad copy, and landing pages. All of these variables come together to result in a Quality Score, and this metric plays a significant role in determining how much you pay to get your ad shown. Quality score is meant to give you a general sense of the quality of your advertising. The 1-10 Quality Score reported for every keyword on your accounts is a quote of the quality of your publicity and landing pages triggered by them. So, having an excellent high Score usually means that the Google Auction systems believe your ad and landing page are applicable and helpful to somebody looking at your ad. Conversion rates are among an essential digital marketing metrics, because the ultimate goal of a PPC campaign is to drive qualified leads to boost sales on your site Unlike other marketing channels like social, you have the ability to track each sale that comes from PPC, so the rate of conversion is tied directly to your effectiveness as a PPC manager. Conversion rates tell a broader story to outline the effectiveness of your marketing efforts across your PPC ads and landing pages. Unlike other PPC metrics that only show how well your keywords, ads and ad messaging is, the conversion rate of your ads also takes into consideration how well your landing pages are converting prospects coming to your website. If you have ever wondered how your PPC marketing is stacking up against your competition than the Average Position of your ads is the metric you want to look at. This parameter is provided by the Google Auction system to help you understand how specific aspects of your PPC strategy is working compared to your competition. This rank determines in which order ads appear on the page. The highest place is “1,” and there’s no “bottom” position. A usual position of 1-8 is usually on the first page of search results, 9-16 is generally on the second page, and so on. Now that we have a basic understanding of the most important PPC metrics lets take a look at some common questions and goals and how to use PPC to achieve these aims! No matter your industry, business, or market, you will have different aims and needs for your PPC campaign. This means that you need to understand what you are trying to accomplish before you choose the metrics that you want to track. Here are a few of the most common business goals that business owners request for their PPC campaigns and the types of metrics and approach I recommend to achieve these aims. Many businesses want to be on the first page of Google, and for good reason since research has shown that most purchases are made on the first page. Achieving this is relatively easy as long as you know how to optimize your PPC campaign around search trends of your target audience along with optimizing technical aspects of your campaigns. Decide which keywords thing for you and bid them large enough to be competitive. Monitor a number of impressions as well as your impression share. This will tell you if you have the volume to get found on the first page. You want your impression share to be at 98 percent or better. Since the first page of Google has a limited number of spots for PPC, you want to make sure your ads rank high enough to be seen. To be consistently seen, you need to attempt to keep a mean position of 5 or greater, and you can check that with the Average Position metric. While appearing on the first page of Google is great, many businesses want to be in the first position on the first page. While appearing on the first position might not always be the best strategy, there are some tips and metrics you can look at to ensure you rank in this spot if it is part of your marketing strategy. If you want to appear in the first spot on the first page of Google, then you need to be ready to pay more per click than everyone competing in your market area. Select keywords that you believe people use while looking for the service or product that you sell. Quality Score and relevancy of keywords, ad copy, and landing page play a significant role in where your ads appear. You will need great keywords to rank in this coveted spot. As soon as your campaign begins, monitor your average CPC, while also tracking your impression share and average position. Every business wants to grow sales and drive qualified leads to boost conversions. That is a no-brainer, and this is why you are using PPC. However, many businesses don’t know how which metrics they should refer to when optimizing for this goal. If you want to track sales and conversions, then you need to setup conversion monitoring. This can be a tracking code for clicks and purchases on your website or call tracking. The type of monitoring that you should choose will be based on your business, industry, and company goals. There are many third-party programs you can use to help with your monitoring needs, but recent changes make monitoring conversion in Google Analytics make using Google products easier to accomplish this task. To know whether your PPC campaign is doing its job, conversions need to become your number one metric with everything else secondary. Most companies monitor form submissions or online purchases, but you may also track phone call conversions. Telephone call tracking is of particular importance for businesses focused on leads rather than sales. With custom scripts packed on your site, it is possible to exhibit unique phone numbers to individuals who clicked on your PPC ads. Now that you know the basic PPC metrics that you can use and how to leverage their information to improve your PPC campaigns, you are ready to increase conversions and boost sales. If you are still unsure how to use your PPC data, then it might be a good time to hire a PPC management professional. I am here to help you and your business leverage PPC marketing to increase sales and reach your business goals. If you are sick of missing your business goals, then take 25 seconds to fill out the form below and we will be in touch with you ASAP!